To facilitate improvements in the delivery of Public Health Services. This is accomplished by establishing regional public health priorities, advocating for the implementation of programs; practices and policies to improve health outcomes; and advance the coordination of services among partners. Includes sectors: health care, public health, social services, government, faith, first responders, education, behavioral health, developmental disability, business, community members. 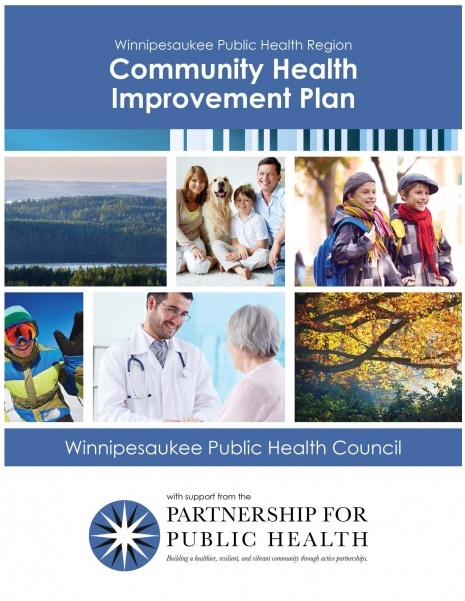 The Winnipesaukee Public Health Council is pleased to present the first Winnipesaukee Community Health Improvement Plan. This Plan builds upon the work of individuals working collectively with support provided by the Lakes Region Partnership for Public Health and Caring Community Network of the Twin Rivers. Our collective vision is to build a healthy, resilient, and vibrant community for every person, and every family. Public health is the practice of preventing disease and promoting good health within groups of people-- from small communities to entire countries. Public Health is YOUR health. It embodies everything from clean air to safe food and water, access to healthcare and safer communities. Through public health planning and prevention initiatives, the public gets sick less frequently, children grow to become healthy adults through adequate resources including health care, and our community reduces the impact of disasters by preparing people for the effects of catastrophes such as hurricanes, floods and terrorist attacks. In preparing this Plan, the Council and its work-groups have reviewed needs assessments, utilizing data from many different sources such as community focus groups, key stakeholder interviews, and surveys. Building on this information, needs have been prioritized and work plans have been developed. This Community Health Improvement Plan identifies needs, goals, measurable objectives, and strategies to help us as we work together on solutions to important issues facing our community. We are all responsible for the health of our citizens. The importance of healthy living and safety in our homes and communities are values that we all share. We look forward to working with the entire community to better understand the health problems confronting our citizens and to implement strategies to respond to the public health needs of our community. We invite you to read through the report, study the objectives and strategies, and consider how you can become involved. The Winnipesaukee Public Health Council thanks the individuals, agencies, state and local governments who participated in this endeavor without whom it would not be possible. Improve Access to Health Insurance and Consumer Navigation of the Health Care System -Reduce financial barriers to health care access by increasing health insurance coverage. Reduce Substance Misuse and Addiction through Prevention, Treatment, and Recovery* -Prevent and reduce substance misuse among youth and young adults with emphasis on misuse of alcohol, tobacco, marijuana, prescription drugs and heroin. Prevent Suicide* -Reduce suicide incidence in the Winnipesaukee Public Health Region. Improve the Health and Well Being of Older Adults and Their Caregivers* -Prevent older adult injury, disability and death due to falls. Support Aging in Place. Prevent Childhood Obesity: Through Healthy Eating and Active Living* -Promote healthy eating and active living at an early age to reduce the lifelong burden of chronic diseases such as heart disease, stroke, diabetes and cancer. Increase Public Health Emergency Preparedness* -Increase regional capacity to prepare for, respond to and recover from public health emergencies. Improve Health through Increased Financial Stability of Individuals and Families -Improve community health by reducing the number of individuals and families experiencing poverty in Belknap County by 20% by 2020.